Joanna Campbell Slan / Vendetta: A Cara Mia Delgatto Mystery – The House of Refuge on Gilbert’s Bar is known for its 150-year history as a way station for shipwrecked sailors. But when Cara Mia visits, the museum becomes the scene of a crime. Linda Gordon Hengerer / Dying for School Tea: A Beach Tea Shop Novella – Chelsea Powell and her sisters are providing treats for Citrus Beach High School’s freshman orientation. Can they solve the murder of the beloved softball coach before someone else dies? Carole W. Price / The Glass Birdhouse – Glass artist Bella hopes to find clues about her student’s death in the woman’s unfinished glass birdhouse. 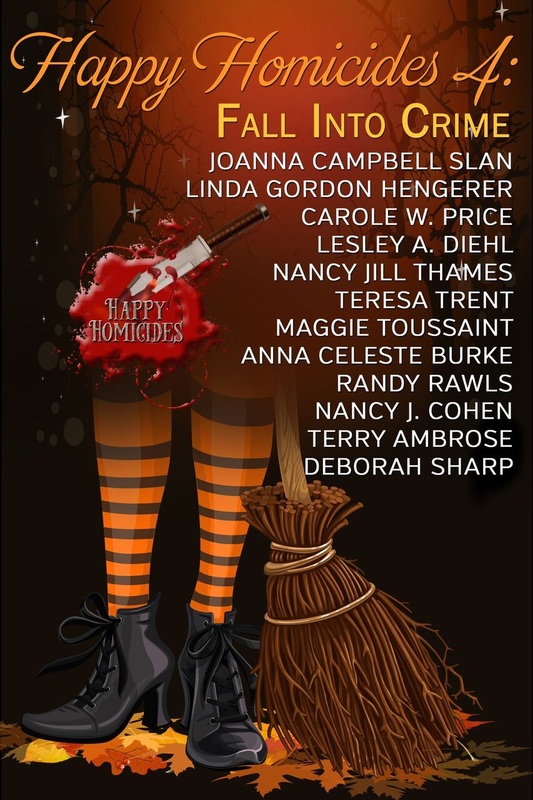 Lesley A. Diehl / Bobbing for Murder – A visit from Darcie’s family is always chaotic, and this time the relatives bamboozle Darcie into having a Halloween party. It’s a decision that definitely comes back to haunt her. Nancy Jill Thames / Raven House – When a reporter is murdered after a fundraiser at the historic Raven House, the police call on Jillian and her Yorkie Teddy to help them investigate. Teresa Trent / Falling for Murder – Helpful hints columnist Betsy Livingston is an expert at household organization but her skills are put to the test when she’s called upon to conduct an efficiency review for a haunted house. Maggie Toussaint / Dead Men Tell Tales – In this third installment of the Lindsey & Ike romantic mystery novella series, things don’t add up after a suspicious hunting accident. The more Sheriff Ike Harper and newspaper editor Lindsey McKay dig, the more questions they find. Anna Celeste Burke / All Hallow’s Eve Heist – Date night for Georgie Shaw and handsome detective Jack Wheeler goes terribly wrong. A botched heist at Marvelous Marley World has everyone scrambling as trigger-happy bad guys head for the Halloween celebration in Arcadia Park. Randy Rawls / Accident, Suicide, or Murder – Retired policeman Jonathan Boykin’s primary interest is improving his golf, but a grieving father’s request to investigate his son’s suspicious death is an entirely different ballgame. Nancy J. Cohen / Haunted Hair Nights – As a new stepmother, hairstylist Marla Vail hopes to win brownie points by helping her daughter with a school haunted house project. Marla has her work cut out for her when she stumbles over a corpse on the spooky estate grounds. Terry Ambrose / Spirit in the Rock – An invitation to a museum’s grand opening turns into a showdown with the spirit world for amateur sleuth Wilson McKenna. Deborah Sharp / Haunting in Himmarshee – When a ghost comes to call, Mace must sort out the haunted from the homicidal in Himmarshee, Florida. Joanna Campbell Slan/Kiki Lowenstein and the Doodoo – A fun family outings turns into a fearful fright, but Kiki Lowenstein is good at sniffing out bad guys. Find out about the authors on their webpages below. Thank you for hosting us here! Thanks for having us here.